O, The Oprah Magazine "10 Titles to Pick Up Now"
A glorious and moving multigenerational, multicultural saga that sweeps from the 1940s through the 1960s in Trinidad and the United States. 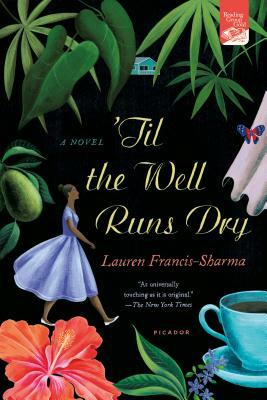 'Til the Well Runs Dry opens in a seaside village in the north of Trinidad, where young Marcia Garcia, a gifted and smart-mouthed sixteen-year-old seamstress, lives alone, raising two small boys and guarding a family secret. When she meets Farouk Karam, an ambitious young policeman (so taken with Marcia that he elicits help from a tea-brewing obeah woman to guarantee her ardor), the rewards and risks in Marcia's life amplify forever. On an island rich with laughter, calypso, Carnival, cricket, beaches, and salty air, sweet fruits and spicy stews, the novel follows Marcia and Farouk from their sassy and passionate courtship through personal and historical events that threaten Marcia's secret, entangle the couple and their children in a tumultuous scandal, and put the future in doubt for all of them. Lauren Francis-Sharma, a child of Trinidadian immigrants, was born in New York City and raised in Baltimore, Maryland. She holds a bachelor’s degree in English literature with a minor in African-American Studies from the University of Pennsylvania and a J.D. from the University of Michigan Law School. She lives in the Washington, D.C., area with her husband and two children. 'Til the Well Runs Dry is her first novel.